Mike and I are back from our honeymoon! 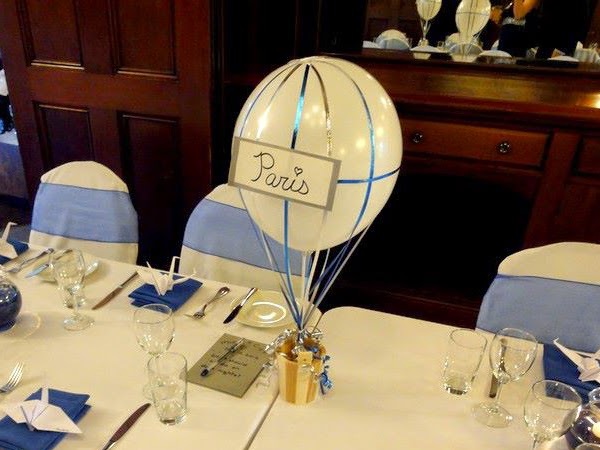 I promise to post lots about the amazing Paris adventures we had, but meanwhile, here's another Pinterest idea I used at our wedding! 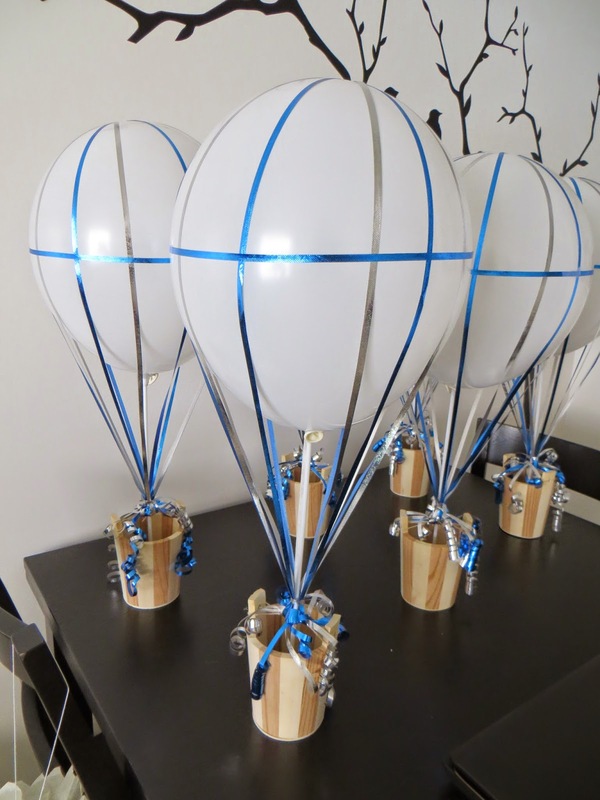 Mike and I set to work on Thursday evening on our wedding centerpieces - DIY air balloons (to match our other travel-themed decorations). The original idea came from this site, but we made a few tweaks to fit with our own liking. 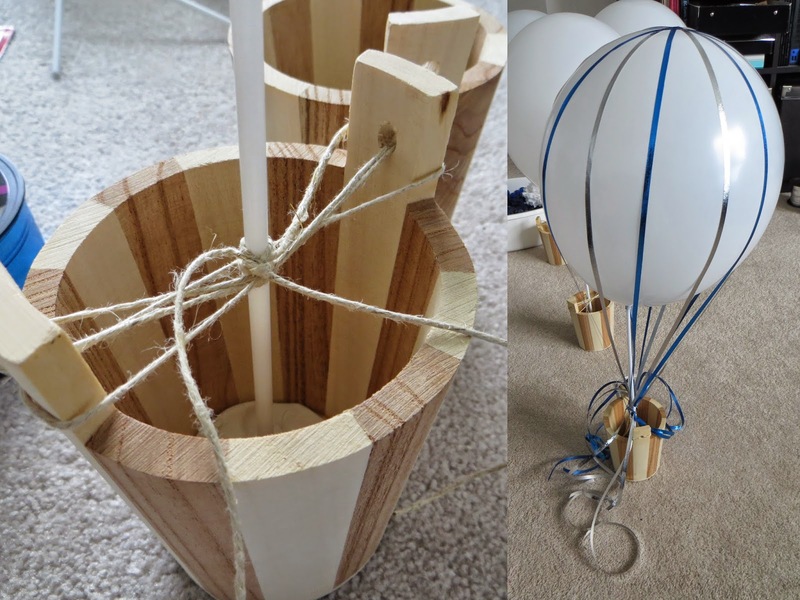 To make the balloons stand up, we stuck modelling clay along the bottom to make sure the stick stayed in one place, then reinforced this with string tied to the sides of the bucket. We covered up the clay with small blue pebbles. Each piece of ribbon was then draped over the balloon and tied to the middle intersection, with the ends left out to be curled (which Mike did an excellent job on). In total, the six centerpieces took Mike and I about two hours to complete... the first couple definitely took the longest, but it got easier when we figured out what was most efficient for us. We had to adjust the middle ribbon a few times before the wedding because the balloons got a bit smaller as time passed, but luckily they all survived the commute to the venue! 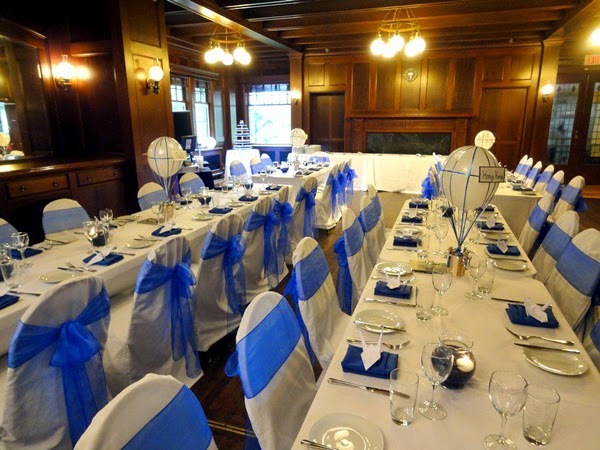 I used these centerpieces to display our table names so that guests could easily find their seat in the reception area. I really loved the way they turned out - and thank you to Julie for taking the wedding photos in this post! I’m having trouble getting the balloon to stay up straight. The balloon tends to want to lay down onto it’s side. Any tips? Do I need thicker sticks? You used regular air and not helium, correct? Have you tried lining the bottom of the basket with modelling clay before sticking the balloon in? That definitely helped keep the balloons up. If they are still falling, perhaps try using smaller-sized balloons. And yes, I used regular air. Helium would have deflated too quickly. Very nice. Can you please let meknow the size of the bucket you used and where did you find them? Can you let me know what kind of stick you used and how you made the balloon stay on the stick. The stick are just regular balloon sticks from a local dollar store. I'm sure you could get them at a party supply store as well. They are made to easily hold a balloon up.